One of the main benefits of having a solid wood worktop over other materials is that the longer you have it for, the better it will look. Over time, wood will develop a patina (gloss or sheen) as it ages, causing its natural colour to become deeper, enriching its appearance. So, if you’re wanting to add a touch of character to your kitchen and make it brim with personality, then a solid wood worktop may be the right choice for you. Solid wood worktops are perfect for making your kitchen a warm and welcoming space. The way in which solid wood worktops are constructed means they are extremely strong and durable, allowing for them to withstand a lot of weight and pressure. 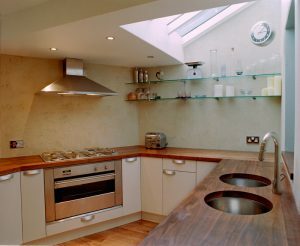 For this reason alone the material is perfect for a kitchen environment as worktops tend to get a lot of wear and tear. Another reason solid wood is such a good material to use is that any dents or scratches that do appear can be sanded out, making the surface look as good as new again. The good thing about having a solid wood worktop is that the way in which they’re installed means that your worktop will be unique to you, as no two pieces of wood are identical. Their unique quality ensures that you will have a kitchen worktop that nobody can compete with, providing your kitchen with a more personal touch. The way in which solid wood worktops are installed means each one is individual and unique. A solid wood worktop is perfect for those of us who worry about hygiene around the kitchen when preparing food. Due to its antibacterial properties, wood is a naturally hygienic surface, meaning you won’t have to be obsessively scrubbing your surfaces to get rid of any stubborn, nasty bacteria that may still be lingering on your worktop after preparing food.